Welcome to the year of the slow invasion, as seemingly inactive mysterious small cubes appear all over the globe… Meanwhile, the Ponds welcome a houseguest: the Doctor! As the Ponds’ time with the Doctor draws to an end, here we have a final celebration of their travels with the Time Lord that equally doubles up as a celebration of many aspects of the series itself. It may lack the kind of high concept hook that has featured in the other ‘blockbuster’ movie-style episodes (Daleks! Dinosaurs! Robot Cowboy! 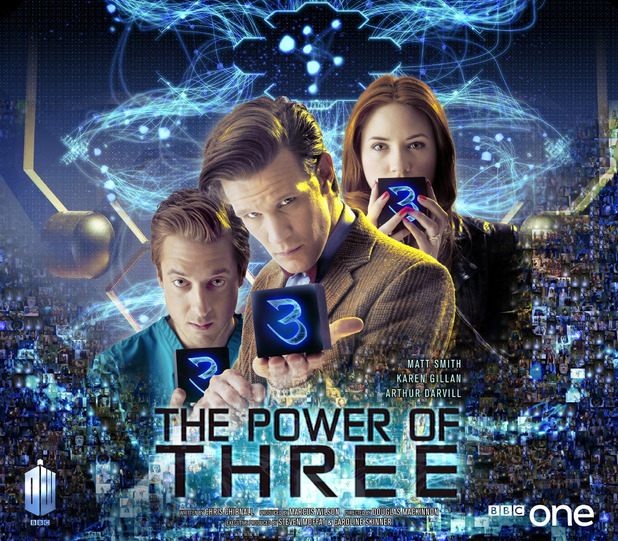 ), but The Power of Three is overall a more satisfying experience than some recent episodes. A worldwide event—the arrival of the mysterious cubes—is chronicled through several collages of news broadcasts, and a celebrity scientist/presenter makes a hilarious appearance too. Some aspects of the plot echo The Lodger, while others recall a host of David Tennant episodes. There’s a solid science fiction idea here, presented in a unique style by writer Chris Chibnall. If you enjoyed the approach of Dinosaurs on a Spaceship, you’ll likely love this. Fans of the more straight-forwardly serious and dramatic A Town Called Mercy might not be so open to this type of Doctor Who. The only downside might be the weak resolution to the problem, but that’s not the real focus of events. At the centre of the story are Amy and Rory. The pair are conflicted, wanting to extend their travels with the Doctor but also feeling the need to concentrate on their more ‘ordinary’ lives too. It’s a dilemma that Rory’s father, Brian (a very welcome rapid return for Mark Williams), gets to the heart of in the episode’s melancholic conclusion.